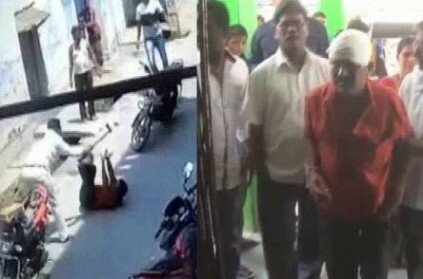 In a shocking case, a man from Telangana was brutally attacked with an axe allegedly over a land dispute on Monday. According to NDTV, the injured man has been identified as Kishan, who was a resident of Markandeya colony in Jagitial. He is reported to have a land dispute with a man named K Lakshma, who hailed from Anantaram. While speaking to ANI, Superintendent of Police (SP), Jagitial district Sindhu Sharma said, "There was a land dispute between Laxman and Kishan as Laxman purchased land from Kishan five years ago and the land was disputed. In the early morning hours of Monday, Laxman attacked Kishan with an axe in Jagitial town after an argument." The police further added that, "minutes after the incident, the accused fled from the spot. Victim Kishan received severe injuries and was shifted to a local hospital for treatment. Currently, the doctors said that the condition of Kishan is stable". A case has been registered against Laxman under section 307 (attempt to murder) of the Indian Penal Code (IPC), while special teams have been formed to arrest the accused who is absconding. '3 வயது சிறுமிக்கு நேர்ந்த கொடூரம்'.. 2 பெண் ஊழியர்களுக்கு வலைவீச்சு! This page contains news relating to various facts and events. The views are generally about current affiars and general topics in diversified areas such as political, international, national, and regional issues, sports, health, travel, lifestyle, technology and business. People having similar interets on the above topics will find this page useful. Telangana Man brutally Attacked With Axe Allegedly Over Land Dispute | India News.